This Fact Sheet describes the history of Ss Mary & John Churchyard from its inception in 1869 when Father Richard Benson became vicar of the newly established parish of Cowley St John. The churchyard was consecrated in 1878 and its geometrical arrangement is unchanged since it was originally constructed. 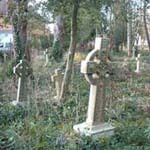 The Fact Sheet also describes some of the memorial inscriptions which have been recorded by the Oxfordshire Family History Society, and which reveal a wide variety of people buried in the churchyard. The range of professions represented can be seen in a selection of memorials. Other lists of memorials contain: memorials to priests and members of religious orders; memorials to children; memorials to members of the armed services. This Fact Sheet describes the life and works of Richard Benson, the first vicar of the Parish of Cowley St John. It outlines his early life, his education at Christ Church, Oxford, and ordination into the Church of England. It then describes his work as a Parish Priest and founder of the Society St John the Evangelist and lists the social projects that he started in east Oxford. Father Benson is buried in the churchyard of Ss Mary and John where the memorial to the Society of St John the Evangelist now stands. 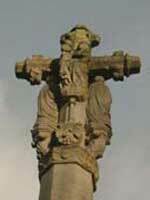 He is also commemorated on the octagonal plinth of the tall memorial cross that stands in the churchyard. This Fact Sheet describes the schools in the parish, concentrating on those founded by the church and their subsequent development. Ss Mary & John School still stands on its original site, and John Irving, its founding headmaster, is buried in the churchyard. In 1865 a workhouse for 330 inmates was completed on the Cowley Road. This Fact Sheet traces its development and its links with people buried in the churchyard. This Fact Sheet describes the development of Public Health in east Oxford during the nineteenth and early twentieth centuries. It explains how changes in legislation and medical understanding of infection and disease coincided with the development of east Oxford as a residential area. It also describes what medical services were available to the less well off in east Oxford before the introduction of the National Health Service. This Fact Sheet describes the origins of the various religious orders residing in the parish during the nineteenth and early twentieth centuries. They were: the Society of St John the Evangelist; the Community of St John the Baptist; the Sisterhood of the Holy Childhood; All Saints Sisters of the Poor; the Community of St Peter; and the Sisterhood of the Compassion. Of these, only All Saints Sisters of the Poor continues to live and work in the parish (see Fact Sheet 7). Opened as St John's Hospital for Incurables in 1874 on part of the land purchased by Father Benson for his church and churchyard, the administration of this Hospital was taken over by All Saints Sisters of the Poor in 1881. This Fact Sheet describes its history, and the more recent projects started in other parts of the site by the Sisters. This Fact Sheet outlines the history of St Alban's Church, founded in 1889 within the parish of Cowley St John. The current church, on the corner of Charles Street and Catherine Street, was built in 1932 and remains an active church within the parish. This Fact Sheet describes the history of one of the oldest institutions in the parish, a leper hospital and chapel dating from 1126. The chapel was rebuilt in 1329 by Oriel College and is still used for services and exhibitions. This Fact Sheet identifies the history of some of the other churches in the area. The Fact Sheet also describes some of the activities provided by these churches and other religious orders in east Oxford. 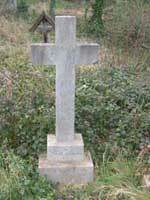 Three uncommon terracotta grave markers are found in the Churchyard. They were made by the Grimsley family in their yard in St Giles', Oxford, in the nineteenth century. This Fact Sheet traces the history of Grimsley's Memorials, and gives details of the individual grave markers in the Churchyard. This Fact Sheet describes the Trinity Labyrinth installed in 2003, the result of community participation with artists Emily Fuller and Helen MacKeith. In 2005, the same artists installed three “sitting walls” around the labyrinth, again with participation from the local community. The symbolism of the labyrinth is explored, and the role of the labyrinth in providing a public “rest space” within the Churchyard.